Now Stupak Has Retired, Who is Going to Hold Obama to His Executive Order to Prevent Federal Abortion Funding? 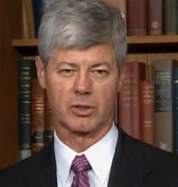 Representative Bart Stupak has announced that he is retiring from his position and will not be running for reelection in the November 2010 midterm elections. Sources familiar with Stupak's thinking describe him as burned out from the long fight over health care in which he emerged as the leading voice of pro-life Democrats wary about the possibility that the legislation would allow federal funds to be spent on abortions. On March 21, Stupak made a deal with Obama, in which Stupak said he would vote for the health care reform bill in exchange for an executive order prohibiting federal funding for abortion. However, Executive Orders cannot and do not trump legislation passed by Congress. All Stupak needed was something he could hold onto for political cover, leaving many of Stupak's supporters feeling very betrayed by Stupak's deal. If you think the executive order meant little a couple weeks ago, it means absolutely nothing today. Americans will pay for abortions through their federal tax dollars, all because Bart Stupak turned out to be a tired snake. Of course, that is if he was even he capable of being reelected.